Holy hot avocados. Until this summer, I hated avocados (and guacamole). After a taste of my friend Christina‘s guac (just to be polite) this summer, I’ve converted. Especially when they are hot. I toss cubed handfuls into eggs with cheddar cheese (green eggs no ham) and into stir fries. The few friends I’ve shared this discovery with have all had the same response: “What happens to the avocado? Does it melt?” Nope. It gets nice and soft and even richer in taste. And it imparts that richness to the rest of the dish. So yes, holy hot avocados. After a relaxing child-free, spa-filled weekend at the Lodge at Woodloch with Christina [A lovely surprise present for each of us from our husbands], I came home armed with recipe ideas and creative juices flowing. We watched a cooking demo using fresh ingredients with natural medicinal properties like shitake mushrooms, asparagus, watercress and leeks. Nathanial Whitmore, a herbalist from Hawley, Pennsylvania, was on hand to explain to explain fascinating details like how shitake mushrooms have natural immune boosting properties. 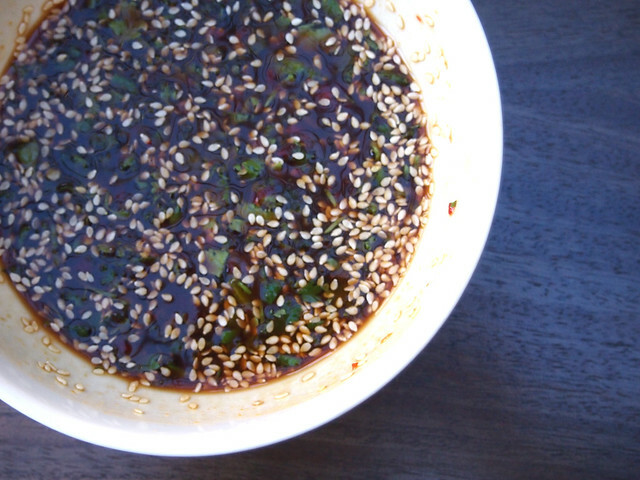 The best take away from the entire weekend was this easy recipe for a soba noodle stir-fry sauce. And a discovery that Hoisin sauce is not non-vegetarian after all (read the label though just to be sure). It’s a perfect blend of salty and sweet and pairs really well with nutty sesame oil. This has become my go-to weeknight meal – especialy since all of the sauce ingredients are always stocked in my fridge. This stir fry can be made with any combination of vegetables. I\\\\\\\'ve made a bok choy, red pepper, shitake mushroom and tofu mix as well as this red bell pepper, broccoli and avocado mix. At Woodloch, the chef used asparagus, dandelion greens, scallions and shallots. Mix all of the sauce ingredients together in a bowl along with 2-3 tablespoons of water. Cook the soba noodles according to the package. Keep to side in cold water until ready to add to the stir fry. In a wok or wide skillet, heat canola oil then add bell peppers. Saute until soft. Add broccoli and cook for about 3-4 minutes. Add avocado, drizzle with a generous glug of sesame oil and cook another 2-3 minutes. Stir in tofu and noodles. Toss well with sauce and cook another 2-3 minutes. Looks like you had too much fun at the spa. 🙂 thanks for the recipe, its always nice to have something other than guaco with avocado. Lovely recipes and amazing photos!!! I am new to vegetarian eating and have since the summer avoided all animal products (except eggs and cheese). Seeing more food options has been a wonderful thing. I have eaten and enjoyed kale and okra to no end this summer!! !